Check on your home from nearly anywhere using the Nest Cam Outdoor 2-pack. Simply pull out your phone or tablet to keep a watchful eye over your home and its occupants, anywhere you're connected to the web. Each camera is weatherproof so you can install it anywhere outside your home. Wired for power, it offers a 24/7 live stream -- rain or shine. 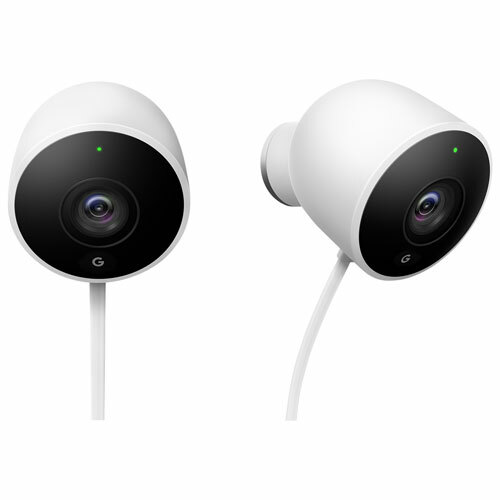 Let the Nest Cam Outdoor 2-pack be your all-seeing watchdog. This pair of stand-alone IP cameras work over your home's internet connection to record footage and enable remote surveillance from your mobile device. They're fully weatherproof so you can install them on your front porch or back patio to keep tabs on visitors and other unexpected activity. Turn on motion alerts and Nest Cam Outdoor will send notifications to your smartphone when it detects movement. 24/7 live video streaming: These wireless stand-alone IP cameras work over your home's Wi-Fi network, so you can access live and recorded footage from the Nest app on your compatible mobile device (phone or tablet with iOS 7 or later, or Android 4 or later). Easy setup: Each Nest Cam Outdoor is easy to install; simply plug it in and set it up from your phone. You can even stick it to a metal surface thanks to its built-in magnet. Spaces: Spaces groups your Nest products by room and lets you see all your cameras at once. And if you're connected to Wi-Fi, it will show you all their live views. The camera was extremely easy to set up and configure. Nest does a great job of making their products easy to get going. The 130 degree coverage ensures a wide area gets monitored. I like the flexibility of setting with you want it to pick up on people, motion or either or as vehicles passing can cause false readings. You need to ensure you have a strong wifi signal where the camera is mounted. I would suggest putting a range extender. My only issue with the camera is the excessive cables. It would be great if Nest created retractable cables. The camera doesn't stay connected. The audio output is whisper quiet, barely audible when you're standing right in front of it. The delay / lag in getting an image is up to a minute or two. Returned it.